Five of the Democratic candidates for Illinois governor, at a forum on criminal and economic justice Saturday in Peoria. 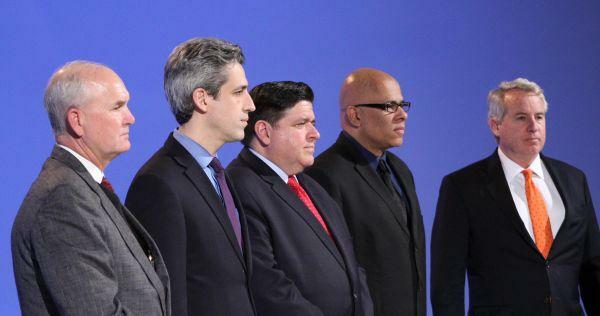 From left: Bob Daiber, state Sen. Daniel Biss, J.B. Pritzker, Tio Hardiman, and Chris Kennedy. A 6th candidate, Robert Marshall, was not present. The only televised debate outside of Chicago between the Democratic candidates for governor has been cancelled, WCIA-TV said Monday. That’s after candidate J.B. Pritzker would not commit to attending the debate in Springfield. Speaking on WILL’s The 21st, Pritzker said he’s already done almost 50 forums and joint appearances. "We actually have uh agreed back in uh December to do six debates, um and that was very well known. This debate came up later." Pritzker said. A campaign spokesperson later reached out Monday evening to say Pritzker misspoke about the timing of the invitation for the Springfield debate, but did not provide another explanation for not participating. Pritzker's opponents Daniel Biss and Chris Kennedy gathered more than 3,400 signatures in petitions to get the March 5 debate to continue. The only televised debate outside of Chicago between the Democratic candidates for governor has been cancelled, WCIA-TV said today (Monday). That’s after candidate JB Pritzker would not commit to attending the debate in Springfield. Speaking on W-I-L-L’s The 21st, Pritzker said he’s already done almost 50 forums and joint appearances.